This disease is suspected to have been around for thousands of years. It usually spreads through contaminated food and water, and targets the human nervous system, which causes symptoms that usually affect the legs and lead to paralysis. In the United States, outbreaks peaked in 1952, when 57,628 cases were reported throughout the nation. Though there is no cure for this disease, a vaccine was developed in the 1950s that has proved effective for decades. Since this is a disease only carried by humans, widespread vaccinations are expected to remove any traces of the disease in future generations. Caused by tiny microbes carried by bodily lice, this devastating disease spread easily in close, cramped quarters and poverty-stricken cities dating back to the 1600s. Symptoms start out with a headache, nausea, and fever, but when left untreated, lead to heat exhaustion, effects on blood circulation, and other complications leading up to organ failure. This epidemic spread throughout Europe during the Thirty Years War in the 1600s and claimed over 10 million lives, but it regained strength and caused several million deaths in Russia, Poland and Romania during World War I. As one of the “youngest” diseases on this list, AIDS spread widely throughout the world in the 1980’s, and since that time it has taken the lives of more than 25 million people. This disease is caused by the Human Immunodeficiency Virus (HIV) which is contracted and spread through contact with bodily fluids and quickly attacks the immune system. There is still no cure for AIDS, although medications like highly-active anti-retroviral therapy treatments have been used to lessen its symptoms and extend the life of those affected by about 4 to 12 years. This mosquito-born illness is one of the longest-surviving threats to our livelihood, as records of the disease go back nearly 4,000 years – and cases are still being recorded today. This is especially true in areas like sub-Saharan Africa, where between 350 to 500 million cases of malaria are diagnosed each year, though only a small percentage of them lead to death today. The largest Malaria epidemics spread throughout many different countries in World War I and World War II, killing over 100,000 American soldiers alone. This disease was common in India for centuries and moved on to the rest of the world in the 19th century. Most often spread through contaminated water and food, cholera causes flu-like symptoms like vomiting, diarrhea, cramping, and severe dehydration, which ultimately leads to the death of those who cannot keep properly hydrated as their immune system fights the disease. Unfortunately, outbreaks are still occurring today, with an estimated three to five million cases and 120,000 deaths reported each year. The largest and most recent cholera outbreak began in Haiti in 2010. It has already claimed over 7,000 lives and has yet to be eradicated. Dating back to the 1500’s, the smallpox epidemic, stemming from the variola virus, has ravaged entire populations. It caused the death of nearly 90 million Native Americans when the Europeans brought it over to the Americas. Symptoms include body aches, high fevers, and a serious rash that results from fluid-filled bumps that leave extensive scarring on the skin. The disease killed an estimated 400,000 Europeans per year at the end of the 18th century, even though a vaccine was created in 1796. In spite the vaccine, breakouts of this disease persist, most recently in the late 1960s, when two million people died in countries all over the globe. This disease is related to malaria in that it spreads from person to person through infected mosquitoes. Responsible for taking millions of lives and wiping out entire colonies and villages during the time of Napoleon’s reign, yellow fever still persists in areas of Africa and South America. While some infections are less severe than others, it is a life-threatening disease that can cause severe internal bleeding and liver failure, which is marked by the yellowing of the skin – prompting this disease’s name. The most famous Yellow Fever epidemic occurred in 1793 in the Untied States in Philadelphia, PA, when over 4,000 people died in a span of only four moths. Today, the disease still exists, and there are an estimated 200,000 cases of yellow fever, causing 30,000 deaths worldwide each year. Also known as the Bubonic Plague, The Black Death is considered to be the first true pandemic on earth, and it cut populations in half throughout parts of the world like Asia and Europe in the fourteenth century. Symptoms of Black Death include swollen lymph glands, fever, cough, bloody sputum and difficulty breathing. The underlying cause or epidemic strain is still being debated today, but thanks to developments in medicine, any resurfacing cases can be easily treated in early stages, so the immense loss in population as seen six centuries ago is unlikely. 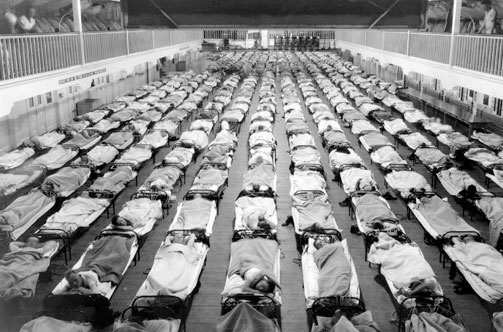 There are many names for this one – including The Spanish Flu and the Flu of 1918 – but no matter which one you use, it is widely known as one of the most deadly outbreaks in history. Though it only survived for a year, this strain of virus was responsible for the deaths of 50 to 100 million people, as it was able to quickly spread from country to country as troops and soldiers returned home from WWI from all around the globe. Symptoms were common to those in today’s influenza virus, but excessive fluid buildup in the lungs as a result of the complications from the flu is what ultimately caused the death of millions. Strains of this disease have been traced back to the DNA of ancient Egyptian mummies, revealing that this epidemic has been wreaking havoc on humanity for thousands of years. Caused by a bacteria that spreads through the air, this disease attacks the lungs and causes internal weakness, chest pains, night sweats, and terrible fits of coughing. In the 19th century, tuberculosis killed an estimated one-quarter of the adult population of Europe, and by 1918 one in six deaths in France were still caused by TB. Today, the disease is still around, affecting nearly 8 million people a year and leading to the death of about 2 million of those infected.